It would be difficult and practically impossible to classify a web page, a document, an email or any other lengthy text notes manually. This is where Naïve Bayes Classifier machine learning algorithm comes to the rescue. A classifier is a function that allocates a population’s element value from one of the available categories. For instance, Spam Filtering is a popular application of Naïve Bayes algorithm. Spam filter here, is a classifier that assigns a label “Spam” or “Not Spam” to all the emails. Naïve Bayes Classifier is amongst the most popular learning method grouped by similarities, that works on the popular Bayes Theorem of Probability- to build machine learning models particularly for disease prediction and document classification. It is a simple classification of words based on Bayes Probability Theorem for subjective analysis of content. Sentiment Analysis– It is used at Facebook to analyse status updates expressing positive or negative emotions. Document Categorization– Google uses document classification to index documents and find relevancy scores i.e. the PageRank. PageRank mechanism considers the pages marked as important in the databases that were parsed and classified using a document classification technique. A Naïve Bayes classifier converges faster, requiring relatively little training data than other discriminative models like logistic regression, when the Naïve Bayes conditional independence assumption holds. With Naïve Bayes Classifier algorithm, it is easier to predict class of the test data set. A good bet for multi class predictions as well. 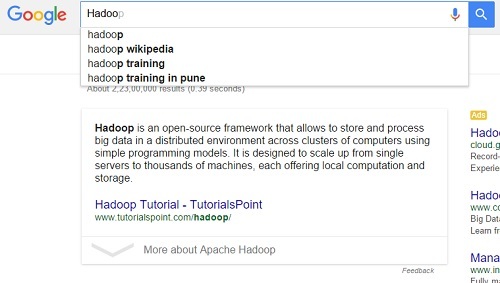 For instance, let’s consider K-Means Clustering for Wikipedia Search results. The search term “Jaguar” on Wikipedia will return all pages containing the word Jaguar which can refer to Jaguar as a Car, Jaguar as Mac OS version and Jaguar as an Animal. K Means clustering algorithm can be applied to group the webpages that talk about similar concepts. So, the algorithm will group all web pages that talk about Jaguar as an Animal into one cluster, Jaguar as a Car into another cluster and so on. Given a smaller value of K, K-Means clustering computes faster than hierarchical clustering for large number of variables. K Means Clustering algorithm is used by most of the search engines like Yahoo, Google to cluster web pages by similarity and identify the ‘relevance rate’ of search results. This helps search engines reduce the computational time for the users. Support Vector Machine is a supervised machine learning algorithm for classification or regression problems where the dataset teaches SVM about the classes so that SVM can classify any new data. It works by classifying the data into different classes by finding a line (hyperplane) which separates the training data set into classes. As there are many such linear hyperplanes, SVM algorithm tries to maximize the distance between the various classes that are involved and this is referred as margin maximization. If the line that maximizes the distance between the classes is identified, the probability to generalize well to unseen data is increased. Linear SVM’s – In linear SVM’s the training data i.e. classifiers are separated by a hyperplane. Non-Linear SVM’s- In non-linear SVM’s it is not possible to separate the training data using a hyperplane. For example, the training data for Face detection consists of group of images that are faces and another group of images that are not faces (in other words all other images in the world except faces). Under such conditions, the training data is too complex that it is impossible to find a representation for every feature vector. Separating the set of faces linearly from the set of non-face is a complex task. SVM offers best classification performance (accuracy) on the training data. SVM renders more efficiency for correct classification of the future data. The best thing about SVM is that it does not make any strong assumptions on data. It does not over-fit the data. SVM is commonly used for stock market forecasting by various financial institutions. For instance, it can be used to compare the relative performance of the stocks when compared to performance of other stocks in the same sector. The relative comparison of stocks helps manage investment making decisions based on the classifications made by the SVM learning algorithm. 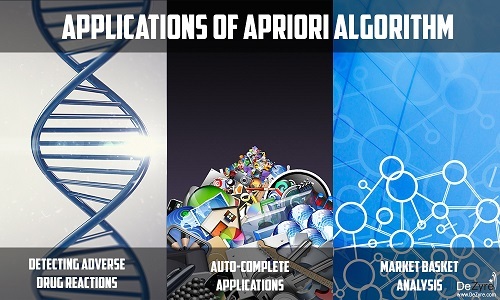 Apriori algorithm is an unsupervised machine learning algorithm that generates association rules from a given data set. Association rule implies that if an item A occurs, then item B also occurs with a certain probability. Most of the association rules generated are in the IF_THEN format. For example, IF people buy an iPad THEN they also buy an iPad Case to protect it. For the algorithm to derive such conclusions, it first observes the number of people who bought an iPad case while purchasing an iPad. This way a ratio is derived like out of the 100 people who purchased an iPad, 85 people also purchased an iPad case. If an item set occurs frequently then all the subsets of the item set, also occur frequently. If an item set occurs infrequently then all the supersets of the item set have infrequent occurrence. It is easy to implement and can be parallelized easily. Apriori implementation makes use of large item set properties. Apriori algorithm is used for association analysis on healthcare data like-the drugs taken by patients, characteristics of each patient, adverse ill-effects patients experience, initial diagnosis, etc. This analysis produces association rules that help identify the combination of patient characteristics and medications that lead to adverse side effects of the drugs. Many e-commerce giants like Amazon use Apriori to draw data insights on which products are likely to be purchased together and which are most responsive to promotion. For example, a retailer might use Apriori to predict that people who buy sugar and flour are likely to buy eggs to bake a cake. Google auto-complete is another popular application of Apriori wherein – when the user types a word, the search engine looks for other associated words that people usually type after a specific word. Linear Regression algorithm shows the relationship between 2 variables and how the change in one variable impacts the other. The algorithm shows the impact on the dependent variable on changing the independent variable. The independent variables are referred as explanatory variables, as they explain the factors the impact the dependent variable. Dependent variable is often referred to as the factor of interest or predictor. It is one of the most interpretable machine learning algorithms, making it easy to explain to others. It is easy of use as it requires minimal tuning. It is the mostly widely used machine learning technique that runs fast. Linear Regression finds great use in business, for sales forecasting based on the trends. If a company observes steady increase in sales every month – a linear regression analysis of the monthly sales data helps the company forecast sales in upcoming months. 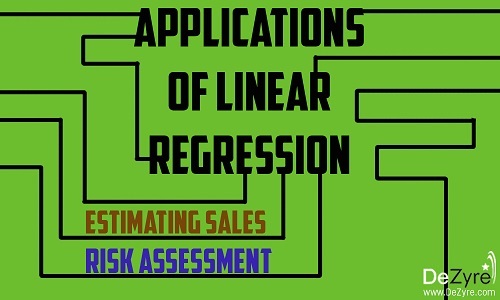 Linear Regression helps assess risk involved in insurance or financial domain. A health insurance company can do a linear regression analysis on the number of claims per customer against age. This analysis helps insurance companies find, that older customers tend to make more insurance claims. Such analysis results play a vital role in important business decisions and are made to account for risk. Explanations about the top machine learning algorithms will continue, as it is a work in progress. Stay tuned to our blog to learn more about the popular machine learning algorithms and their applications!!! You are making a weekend plan to visit the best restaurant in town as your parents are visiting but you are hesitant in making a decision on which restaurant to choose. Whenever you want to visit a restaurant you ask your friend Tyrion if he thinks you will like a particular place. To answer your question, Tyrion first has to find out, the kind of restaurants you like. You give him a list of restaurants that you have visited and tell him whether you liked each restaurant or not (giving a labelled training dataset). When you ask Tyrion that whether you will like a particular restaurant R or not, he asks you various questions like “Is “R” a roof top restaurant?” , “Does restaurant “R” serve Italian cuisine?”, “Does R have live music?”, “Is restaurant R open till midnight?” and so on. Tyrion asks you several informative questions to maximize the information gain and gives you YES or NO answer based on your answers to the questionnaire. Here Tyrion is a decision tree for your favourite restaurant preferences. A decision tree is a graphical representation that makes use of branching methodology to exemplify all possible outcomes of a decision, based on certain conditions. In a decision tree, the internal node represents a test on the attribute, each branch of the tree represents the outcome of the test and the leaf node represents a particular class label i.e. the decision made after computing all of the attributes. The classification rules are represented through the path from root to the leaf node. Classification Trees- These are considered as the default kind of decision trees used to separate a dataset into different classes, based on the response variable. These are generally used when the response variable is categorical in nature. Regression Trees-When the response or target variable is continuous or numerical, regression trees are used. These are generally used in predictive type of problems when compared to classification. Decision trees can also be classified into two types, based on the type of target variable- Continuous Variable Decision Trees and Binary Variable Decision Trees. It is the target variable that helps decide what kind of decision tree would be required for a particular problem. Why should you use Decision Tree Machine Learning algorithm? These machine learning algorithms help make decisions under uncertainty and help you improve communication, as they present a visual representation of a decision situation. 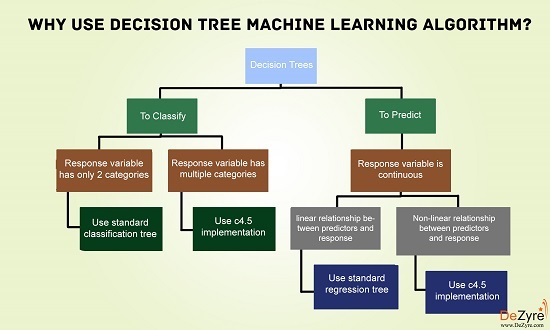 Decision tree machine learning algorithms help a data scientist capture the idea that if a different decision was taken, then how the operational nature of a situation or model would have changed intensely. Decision tree algorithms help make optimal decisions by allowing a data scientist to traverse through forward and backward calculation paths. Decision trees are robust to errors and if the training data contains errors- decision tree algorithms will be best suited to address such problems. Decision trees are best suited for problems where instances are represented by attribute value pairs. If the training data has missing value then decision trees can be used, as they can handle missing values nicely by looking at the data in other columns. Decision trees are best suited when the target function has discrete output values. Decision trees are very instinctual and can be explained to anyone with ease. People from a non-technical background, can also decipher the hypothesis drawn from a decision tree, as they are self-explanatory. When using decision tree machine learning algorithms, data type is not a constraint as they can handle both categorical and numerical variables. Decision tree machine learning algorithms do not require making any assumption on the linearity in the data and hence can be used in circumstances where the parameters are non-linearly related. These machine learning algorithms do not make any assumptions on the classifier structure and space distribution. These algorithms are useful in data exploration. Decision trees implicitly perform feature selection which is very important in predictive analytics. When a decision tree is fit to a training dataset, the nodes at the top on which the decision tree is split, are considered as important variables within a given dataset and feature selection is completed by default. Decision trees help save data preparation time, as they are not sensitive to missing values and outliers. Missing values will not stop you from splitting the data for building a decision tree. Outliers will also not affect the decision trees as data splitting happens based on some samples within the split range and not on exact absolute values. The more the number of decisions in a tree, less is the accuracy of any expected outcome. A major drawback of decision tree machine learning algorithms, is that the outcomes may be based on expectations. When decisions are made in real-time, the payoffs and resulting outcomes might not be the same as expected or planned. There are chances that this could lead to unrealistic decision trees leading to bad decision making. Any irrational expectations could lead to major errors and flaws in decision tree analysis, as it is not always possible to plan for all eventualities that can arise from a decision. Decision Trees do not fit well for continuous variables and result in instability and classification plateaus. Decision trees are easy to use when compared to other decision making models but creating large decision trees that contain several branches is a complex and time consuming task. Decision tree machine learning algorithms consider only one attribute at a time and might not be best suited for actual data in the decision space. Large sized decision trees with multiple branches are not comprehensible and pose several presentation difficulties. Decision trees are among the popular machine learning algorithms that find great use in finance for option pricing. Remote sensing is an application area for pattern recognition based on decision trees. Decision tree algorithms are used by banks to classify loan applicants by their probability of defaulting payments. Gerber Products, a popular baby product company, used decision tree machine learning algorithm to decide whether they should continue using the plastic PVC (Poly Vinyl Chloride) in their products. Rush University Medical Centre has developed a tool named Guardian that uses a decision tree machine learning algorithm to identify at-risk patients and disease trends. The Data Science libraries in Python language to implement Decision Tree Machine Learning Algorithm are – SciPy and Sci-Kit Learn. The Data Science libraries in R language to implement Decision Tree Machine Learning Algorithm is caret. Let’s continue with the same example that we used in decision trees, to explain how Random Forest Machine Learning Algorithm works. Tyrion is a decision tree for your restaurant preferences. However, Tyrion being a human being does not always generalize your restaurant preferences with accuracy. To get more accurate restaurant recommendation, you ask a couple of your friends and decide to visit the restaurant R, if most of them say that you will like it. Instead of just asking Tyrion, you would like to ask Jon Snow, Sandor, Bronn and Bran who vote on whether you will like the restaurant R or not. This implies that you have built an ensemble classifier of decision trees – also known as a forest. You don’t want all your friends to give you the same answer – so you provide each of your friends with slightly varying data. You are also not sure of your restaurant preferences and are in a dilemma.You told Tyrion that you like Open Roof Top restaurants but maybe, just because it was summer when you visited the restaurant you could have liked it then. You may not be a fan of the restaurant during the chilly winters. Thus, all your friends should not make use of the data point that you like open roof top restaurants, to make their recommendations for your restaurant preferences. By providing your friends with slightly different data on your restaurant preferences, you make your friends ask you different questions at different times. In this case just by slightly altering your restaurant preferences, you are injecting randomness at model level (unlike randomness at data level in case of decision trees). Your group of friends now form a random forest of your restaurant preferences. Random Forest is the go to machine learning algorithm that uses a bagging approach to create a bunch of decision trees with random subset of the data. A model is trained several times on random sample of the dataset to achieve good prediction performance from the random forest algorithm.In this ensemble learning method, the output of all the decision trees in the random forest, is combined to make the final prediction. The final prediction of the random forest algorithm is derived by polling the results of each decision tree or just by going with a prediction that appears the most times in the decision trees. For instance, in the above example – if 5 friends decide that you will like restaurant R but only 2 friends decide that you will not like the restaurant then the final prediction is that, you will like restaurant R as majority always wins. Why use Random Forest Machine Learning Algorithm? There are many good open source, free implementations of the algorithm available in Python and R.
It maintains accuracy when there is missing data and is also resistant to outliers. Simple to use as the basic random forest algorithm can be implemented with just a few lines of code. Random Forest machine learning algorithms help data scientists save data preparation time, as they do not require any input preparation and are capable of handling numerical, binary and categorical features, without scaling, transformation or modification. Implicit feature selection as it gives estimates on what variables are important in the classification. Overfitting is less of an issue with Random Forests, unlike decision tree machine learning algorithms. There is no need of pruning the random forest. These algorithms are fast but not in all cases. A random forest algorithm, when run on an 800 MHz machine with a dataset of 100 variables and 50,000 cases produced 100 decision trees in 11 minutes. Random Forest is one of the most effective and versatile machine learning algorithm for wide variety of classification and regression tasks, as they are more robust to noise. It is difficult to build a bad random forest. In the implementation of Random Forest Machine Learning algorithms, it is easy to determine which parameters to use because they are not sensitive to the parameters that are used to run the algorithm. One can easily build a decent model without much tuning. Random Forest machine learning algorithms can be grown in parallel. This algorithm runs efficiently on large databases. They might be easy to use but analysing them theoretically, is difficult. Large number of decision trees in the random forest can slow down the algorithm in making real-time predictions. If the data consists of categorical variables with different number of levels, then the algorithm gets biased in favour of those attributes that have more levels. In such situations, variable importance scores do not seem to be reliable. When using RandomForest algorithm for regression tasks, it does not predict beyond the range of the response values in the training data. Random Forest algorithms are used by banks to predict if a loan applicant is a likely high risk. They are used in the automobile industry to predict the failure or breakdown of a mechanical part. These algorithms are used in the healthcare industry to predict if a patient is likely to develop a chronic disease or not. They can also be used for regression tasks like predicting the average number of social media shares and performance scores. Recently, the algorithm has also made way into predicting patterns in speech recognition software and classifying images and texts. Data Science libraries in Python language to implement Random Forest Machine Learning Algorithm is Sci-Kit Learn. Data Science libraries in R language to implement Random Forest Machine Learning Algorithm is randomForest. The name of this algorithm could be a little confusing in the sense that Logistic Regression machine learning algorithm is for classification tasks and not regression problems. The name ‘Regression’ here implies that a linear model is fit into the feature space. This algorithm applies a logistic function to a linear combination of features to predict the outcome of a categorical dependent variable based on predictor variables. The odds or probabilities that describe the outcome of a single trial are modelled as a function of explanatory variables. Logistic regression algorithms helps estimate the probability of falling into a specific level of the categorical dependent variable based on the given predictor variables. Just suppose that you want to predict if there will be a snowfall tomorrow in New York. Here the outcome of the prediction is not a continuous number because there will either be snowfall or no snowfall and hence linear regression cannot be applied. Here the outcome variable is one of the several categories and using logistic regression helps. · Binary Logistic Regression – The most commonly used logistic regression when the categorical response has 2 possible outcomes i.e. either yes or not. Example –Predicting whether a student will pass or fail an exam, predicting whether a student will have low or high blood pressure, predicting whether a tumour is cancerous or not. · Multi-nominal Logistic Regression – Categorical response has 3 or more possible outcomes with no ordering. Example- Predicting what kind of search engine (Yahoo, Bing, Google, and MSN) is used by majority of US citizens. · Ordinal Logistic Regression – Categorical response has 3 or more possible outcomes with natural ordering. Example- How a customer rates the service and quality of food at a restaurant based on a scale of 1 to 10.